Yay, it's here! I've been waiting for my friend Katie's book to come out for months and it was such a thrill getting it in the mail the other day. She and I are book twins because we were both writing a sewing book at the same time and it was so neat emailing back and forth and comparing experiences. Every time one of us hit an author milestone we were there to cheer each other on! Katie is such a sweet, sweet lady and I just love her sense of humor. She blogs over at The Red Kitchen, so be sure to check her out! OK, blah blah blah, about this book!! 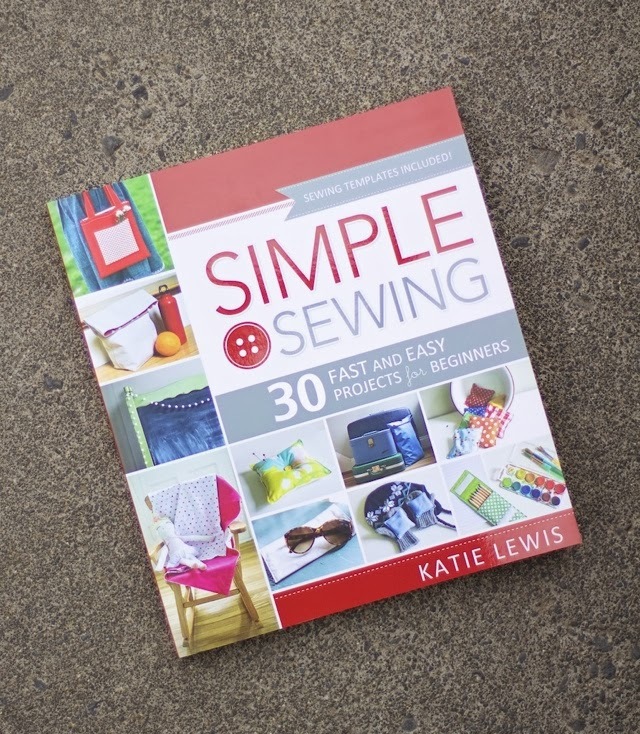 Katie Lewis' book, titled: "Simple Sewing: 30 fast and easy projects for beginners" is a darling little collection of projects that are sure to make even the newest of sewers feel confident. In fact, I fully plan on doing a few of these projects with Paige-she'd love them! But even if you're an experienced sewer, like myself (uh...if time counts as experience, 'cause Imma be honest, I'm still scared of buttonholes) the book is still so fun! 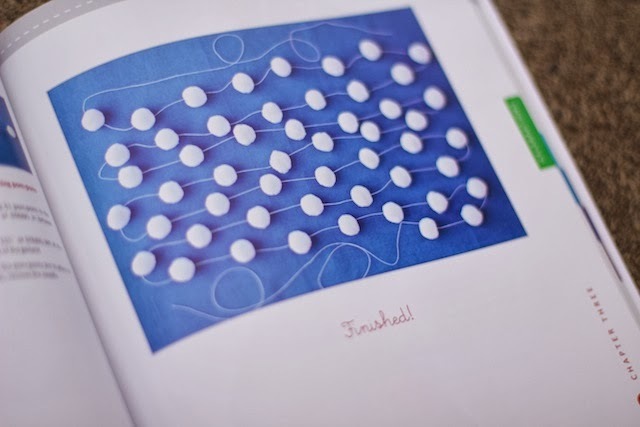 In fact, I was amazed to find that I actually prefer a book of simple projects like this over more specific designs because it gives my mind a jumping off point to think of creative embellishments or unique combinations to make the projects my own. I like a blank slate to work with sometimes. 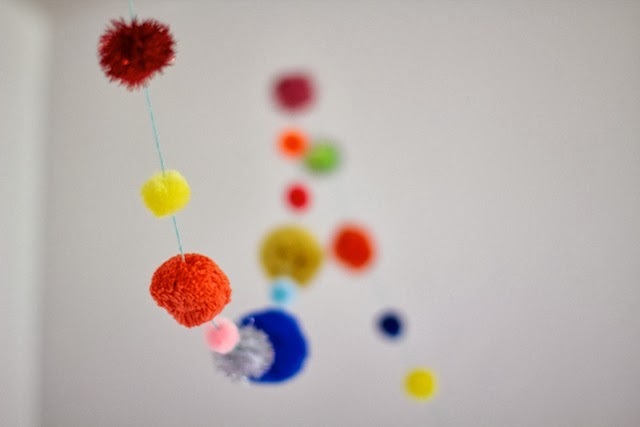 The project I picked out to share from the book is the easiest-project-ever pom pom garland. Ugh, you guys, this was so deliciously easy to make. 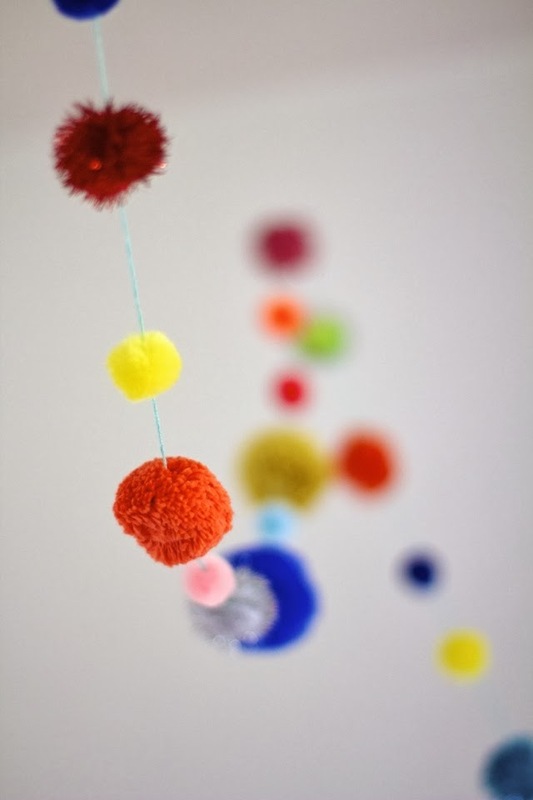 And what is it about pom poms?? They're basically polka dots, which means I need them everywhere. I want to make 1,000 of these garlands! I've had this beautiful box of pom poms in various sizes and colors that I've been saving for just the right project and I was so excited to use them!! 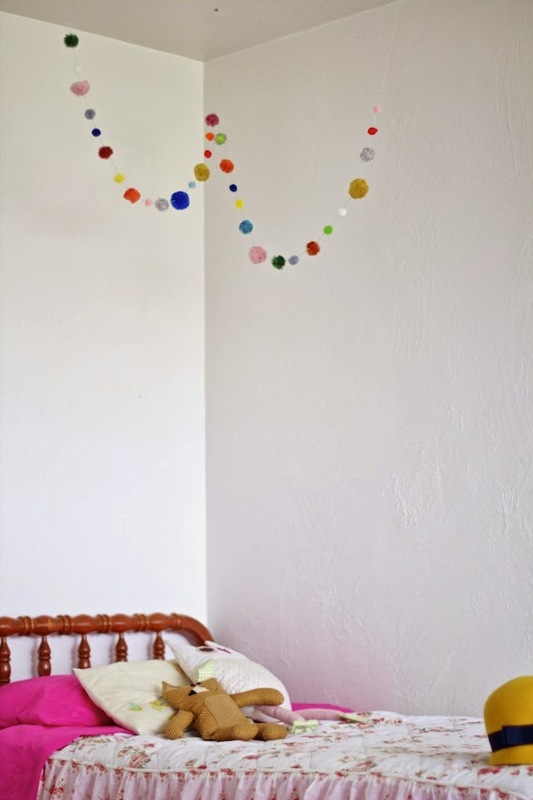 I strung them on mint green embroidery floss and hung them over Paige's bed. It's the perfect little pop of happy color in the corner of her room! And I love it hung with clear fishing twine so that it looks like it's floating. The pictures don't do it justice, it's so cute in real life! 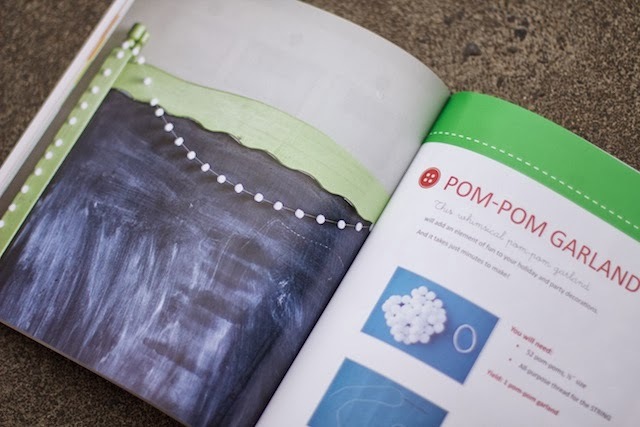 Besides the super easy projects, what I love about this book is that the patterns in the back don't have to be enlarged. I know you guys will appreciate that! It's just all-around lovely, and I'm so proud of Katie for the incredible job she did on it! Oh thank you for the chance Disney! This looks like a wonderful book! I've missed it, if only I had read this before,. 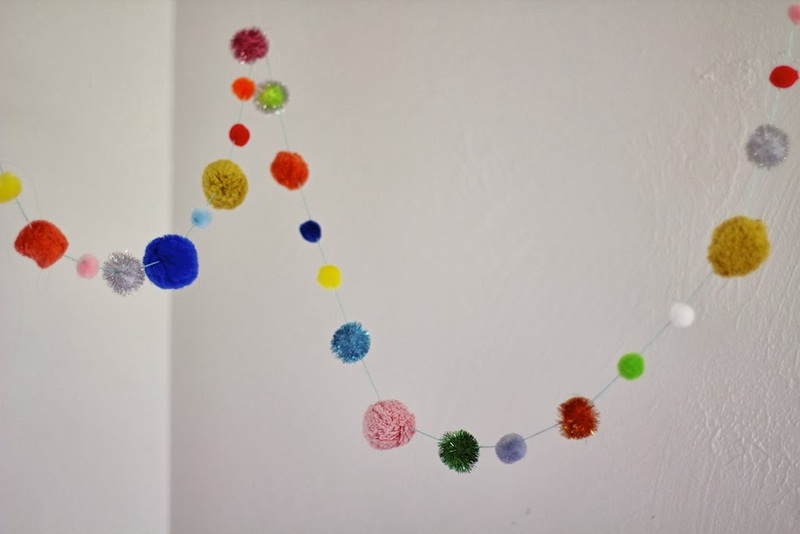 well those hanging pom poms are indeed cheery and cute, I would love to learn how to make some, so it has something to deal with embroidery?